The demand for sporty compact models has developed very dynamically in recent years and with the introduction of the A 45 in 2012, Mercedes presented a real benchmark in the compact segment. 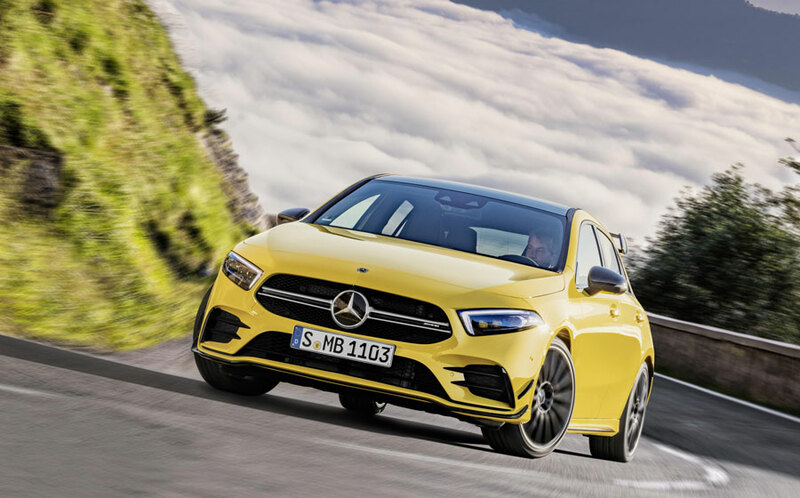 With the new Mercedes-AMG A 35, they are fulfilling the brand’s promise of offering driving performance in every detail. Body shell, suspension, all-wheel drive, transmission, driving programs, fine tuning – every detail has been designed for maximum driving dynamics without compromising on everyday comfort. The performance at sports car level (acceleration 0-62 mph in 4.7 seconds) and the specific design also strengthen the identity as a member of the performance family. A true AMG hot hatch. The powerful exterior design adds characteristic AMG elements to the design idiom of the A-Class. The radiator grille with twin louvres, the AMG Line front apron with flics on the air intakes, a front splitter and silver chrome trims on the louvres in the outer air intakes are distinguishing features at the front. In the side view, the aerodynamically optimised 18-inch light-alloy wheels in twin-spoke design and the side sill panels of the AMG Line catch the eye. The rear view is dominated by the rear apron with a new diffuser insert, the spoiler lip on the roof and the two round tailpipe trims. The 2.0-litre turbo engine is a new development and is based on the M 260 four-cylinder engine in the new A-Class. The variable AMG Performance 4MATIC combines the best possible traction with lots of driving fun. The spectrum ranges from front-wheel drive only to a 50:50 percent distribution to the front and rear axles. The new Mercedes-AMG A 35 4MATIC will make its world premiere at the Paris Motor Show on 2 October 2018, sales will start in October 2018, and market launch will kick off in Q1 2019 in the UK.